© 2018 Your Life Well Lived - All rights reserved. San Ignacio, Baja, Mexico: NEXT ONE: 2021!! F.U.N. is a Fundamental Universal Need. Every single human culture and even throughout the animal kingdom, PLAY and FUN are REQUIREMENTS of life. To develop our brain, to grow, to learn, to survive through the worst moments, we must play. You see kids playing in war zones and in extreme poverty because they MUST. It is the same for adults, but many of us have forgotten this F.U.N. Without it, we are not living fully and cannot contribute as abundantly to our world, the ones we love and to our own highest good. Experiences in the glories of nature are the fastest route back to our essence—our F.U.N. and to heal what has come before. These experiences become embedded in our cells (literally) and then can be called upon afterwards to bolster us through the storms of life. I know this from my own experiences after participating as a guide, naturalist and F.U.N. seeker in Baja with the whales. I used this embedded experience to revisit again and again in my mind and body and it sustained and guided me in a myriad of ways. Having also worked in wild dolphin assisted therapy and seen profound changes in people with physical and emotional challenges and their families (I had to see it to believe it first! ), I was ever changed by knowing there is something special about connecting with dolphins and whales that changes you profoundly. Recently, taking a client on a wild dolphin encounter, she swam with them for only a few minutes but she was the only one in our small group who could hear their clicks, whistles and chirps. She felt it throughout her body and immediately noticed the hard knot of anxiety that was often present in her chest just dissolve. Joy came in then and took up the space that was supposed to live there! This is the magic. Sometimes it’s more subtle and it will show up later, or in dreams, or in your approach to life anew, but it’s undeniable. Come, re-claim your joy—or claim it for the first time. It’s waiting for you! What YOU Get Out of It? F.U.N. is the vital essence that many of us need to re-claim, along with our JOY and EASE. Where in your life do you need Inspiration? You will be improving, heightening, and inspiring your motivation, your ease, and the fullness of your heart’s desire. Bring it! Your stuckness, the parts that are hard to accept in yourself--they are welcome. 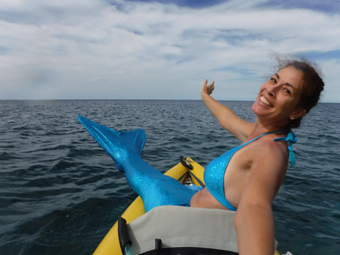 There’s an answer for you in this magical, natural place and in your connection with the whales, the story they offer you, the F.U.N. work you will do while with our group and on your own while alone. When your mind, body and spirit are brimming with joy and in alignment, your goals, needs, and challenges can be met with more EASE. Let nature and the power of connecting with wild Cetaceans fill you, connect you back to your best self, if even for the first time. Nothing brings us into alignment with our true essence faster than peak experiences in nature—connecting with something larger than ourselves (literally), with majesty, magnificence and an awe-inspiring story. This retreat is also a perfect opportunity for improving family bonding and connection through fun, joy and mutual support and help. I have seen families transform how they interact and feel about each other during and after nature based experiential retreats. It’s a great way to kick start a new family dynamic! Group coaching/inspirational sessions and one personal/individual coaching session is included in the cost of the retreat, including follow up by email after we depart! Why Do the Whales Do This? This mystery is even more of a reason to come to Baja. NOWHERE IN THE WORLD do whales deliberately, actively and determinedly approach humans and WANT to be petted, kissed, hugged and played with. The 40 ton mothers gently approach the pangas (small fishing boats that seat about 10-12 people) with their calves which weigh 2000 pounds at birth but are much larger by the time they start visiting people. There is a mysterious story here with the whales about redemption and forgiveness that can change lives. These are the same whales (even some still living) that remember us as those beings that nearly sent them to extinction twice—the last time up into 1940’s before they were protected. They were called the “Devil Fish” because they had killed so many whalers by ramming and smashing their small harpoon boats. 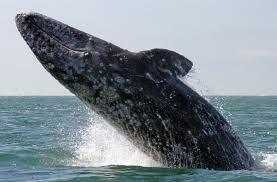 The gray whales had been migrating to several lagoons in Baja since before the documented arrival of humans. After the gray whales were finally protected in 1946, local fishermen were afraid of these giants given their reputation with the whalers. 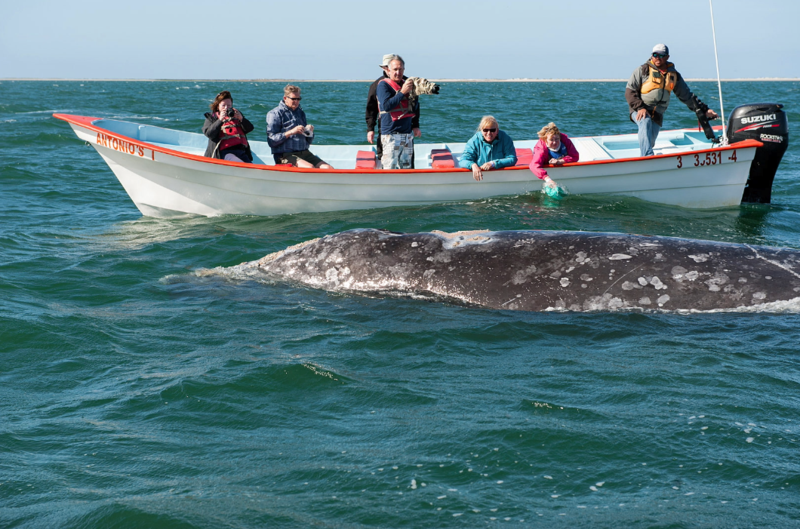 However, in the 1970s a whale closely approached one of these fishermen in his panga in San Ignacio Lagoon and the tale goes that he was egged on by an American who was with him to reach out and touch the whale. He fearfully did so and the new story began. WHY would a whale who KNEW they had been mercilessly hunted for more than a century approach those same, as far as the whale knew, humans???? Why would he or she want to be TOUCHED ever again by a human? This is the magical story, the mystery, the reason people who I met have come back to San Ignacio every year for 20 or more years, just to connect once again with one of the world’s largest animals who have offered redemption and forgiveness. We will be using this phenomenon as we focus on our own goals during the retreat. And then they brought their babies to us….They look us in the eye. They roll over for tummy rubs. They blow in your face. They seem to try to shoot water right at us and you can almost hear them laughing while we yell out and laugh. They want you to pet them all over, even inside their mouths. They put on glorious displays of leaps, tail slaps, breaches, spy hops, rolls, bumps and more. The mothers literally push their babies up to the boats. Sometimes they leave them there to play and go take a break. Every moment, not knowing what will happen, except that you are perfectly safe, is pure thrill. Anticipation heightens all of your senses and you see even more sharply the beauty in the lagoon, the small movements of the other animals on sea and land. This place, the lagoon and the land around it, holds magic, from the glorious sunsets to the beauty of the dry desert scape. It’s the only way to describe it. Seeker of F.U.N. and ‘Happiness Locator’ for others. When an intelligent being with a tremendous capacity for compassion that could exceed our own* looks at you in the eye, really looks into you, you are forever changed. This sentient being could crush you in an instant, but instead, seeks out your touch and brings you their babies. What do they get out of it? Why do they do it? The mystery of the forgiveness from the whales and our human redemption pulled me in and I want to share this magic with you and help you find your inspiration. * We know now from recent research that whale and dolphins’ brains have even more developed areas than humans that correspond to what is referred to as ‘empathy’ and ‘compassion’ connections and neural pathways. Indeed, there are many documented incidences of whales and dolphins saving each other and even other species (including humans) from attacks and other dangers. San Ignacio may not be the biggest lagoon of the three the whales generally visit but it is the best protected and regulated, the most relaxed with and the most respectful of the whales. 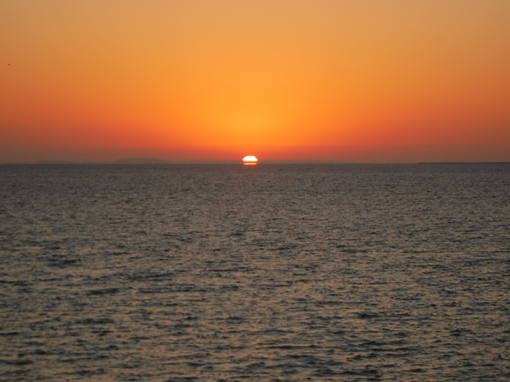 There are amazing sunrises and sunsets, star filled nights and crystal clear days. March is the best time to go since it is getting warmer. ** Most food preferences and restrictions can be accommodated. Phew, because I have plenty of them ;). Contact me for more information. Everyone wants to kiss a whale, and most everyone gets to!! Looking into the eye of a whale close up will change you forever! Other natural wonders at the Lagoon are as abundant as the whales. A great place to explore and learn about. Lagoon Time by Steven Swartz is a highly recommended book! My constant travel companion and Intrepid Explorer, Winnie the Pooh. A view from the pool of the beautiful La Mision Hotel in Loreto where we will stay the night before and after the camp at San Ignacio Lagoon. 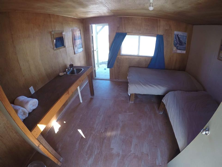 Lots of amenities and a great base from which to explore the Sea of Cortez and other natural wonders around Loreto if you choose to stay additional time. Contact us for more information! A massive Gray whale skeleton is right on the beach at our camp! Clear days and nights in our super eco/green camp! 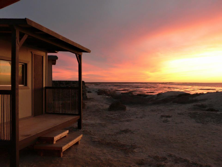 Enchanting sunsets at San Iganacio Lagoon! 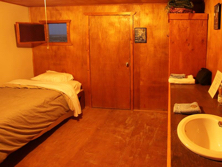 Cozy, rustic cabins at the Lagoon with everything you need. 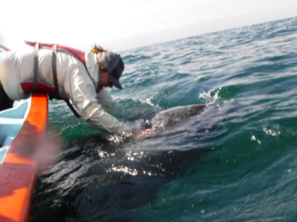 With SIX whale watches scheduled on our retreat, you are sure to get to touch, hug and kiss a Gray Whale! RETREAT IS FULL FOR 2019! Send a message through the contact page if you want to be put on the list for subsequent retreats!